Background: Silver nanosystems have attracted considerable attention for numerous applications in optoelectronics. The localized surface plasmon of silver nanoparticles embedded into mesoporous titania gives rise to an enhancement of local optical field in the vicinity of Ag nanoparticles which act as efficient light-trapping components, resulting in a visible wavelength-dependent photocurrent. 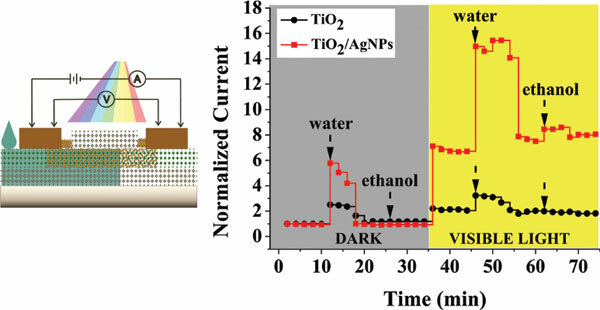 Objective: In this paper, we synthetized patterned nanocomposites formed by titania mesoporous thin films loaded with alkanethiol functionalized Ag nanoparticles and we demonstrated that these stable and accessible nanostructures possess a photocurrent response. Method: Mesoporous thin films are created by combining sol-gel synthesis and template selfassembly. Based on a photolithography technique, silver nanoparticles were selectively photodeposited and then stabilized with octanethiols. Current vs. voltage curves with and without light were compared, where selective light wavelength measurements were achieved by using visible bandpass filters. The optofluidic behavior was evaluated by placing a drop of solutions on the mesoporous film. Results: We demonstrate photocurrent in these mesoporous thin film structures decorated with chemistabilized Ag nanoparticle-based conductive arrays, with significantly enhanced photocurrent peak at the plasmon resonant wavelength around 540 nm. Our findings offer a possibility to perform improved fluid detection with silver-mesoporous titania electronic devices. Conclusion: We showed that an optofluidic sensitive nanocomposite circuit consisting of alkanethiol- functionalized metal nanoparticles embedded in a mesoporous oxide thin film matrix can be produced. Mesoporous oxide thin films, silver nanoelectrodes, surface plasmon resonance, photocurrent, nanosystems, optoelectronic.